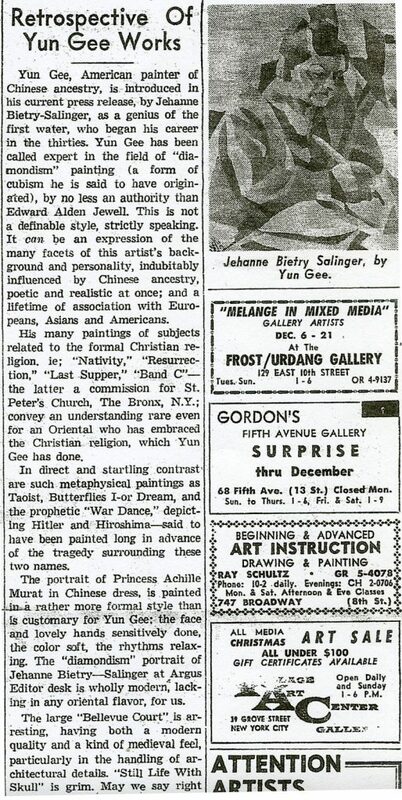 Yun Gee, American painter of Chinese ancestry, is introduced in his current press release by Jehanne Bietry-Salinger, as a genius of the first water, who began his career in the thirties. Yun Gee has been called expert in the field of “diamondism” painting (a form of cubism he is said to have originated), by no less an authority than Edward Alden Jewell. This is not a definable style, strictly speaking. It can be an expression of the many facets of this artist’s background and personality, indubitably influenced by Chinese ancestry, poetic and realistic at once; and a lifetime of association with Europeans, Asians and Americans. His many paintings of subjects related to the formal Christian religion, ie; “Nativity,” “Resurrection,” “Last Supper,” “Band C” – the latter a commission for St. Peter’s Church, The Bronx, N.Y.; convey an understanding rare even for an Oriental who has embraced the Christian religion, which Yun Gee has done. In direct and startling contrast are such metaphysical paintings as Taoist, Butterflies I-or Dream, and the prophetic “War Dance,” depicting Hitler and Hiroshima – said to have been painted long in advance of the tragedy surrounding these two names. The portrait of Princess Achille Murat in Chinese dress, is painted in a rather more formal style than is customary for Yun Gee; the face and lovely hands sensitively done, the color soft, the rhythms relaxing. The “diamondism” portrait of Jehanne Bietry-Salinger at Argus Editor desk is wholly modern, lacking in any oriental flavor, for us. The larger “Bellevue Court” is arresting, having both a modern quality and a kind of medieval feel, particularly in the handling of architectural details. “Still Life with Skull” is grim. May we say right here that this painter does not, to our knowledge, do a picture simply for the thrill of tossing paint about. All have meaning, whether understandable or not to the viewer. The dulled yellow-green kind of over-all cloak seen in so many Yun Gee canvases will be called by some “morbid.” That this approach is meaningful to him cannot be denied. Certainly he has not been influenced by the floor-to-ceiling collection from the brushes of just about every great painter that cover his studio walls, ie; Allesandro Allori, Paul 8Gauguin, Van Gogh, Cezanne, Homer, Gerricault, Derain. . . and so on. He could be influenced by the garrulous mynah birds who share the E. Tenth St. studio, creating an atmosphere almost jungle-like, despite the whir of overhead jets, and sizzling city radiators. Yun Gee was at one time a research engineer for the War Department, and also a graphic engineer for Sperry Gyroscope. Technical background such as this surely may have been a contributing factor in the presentation of geometric forms recognized in certain of his paintings.